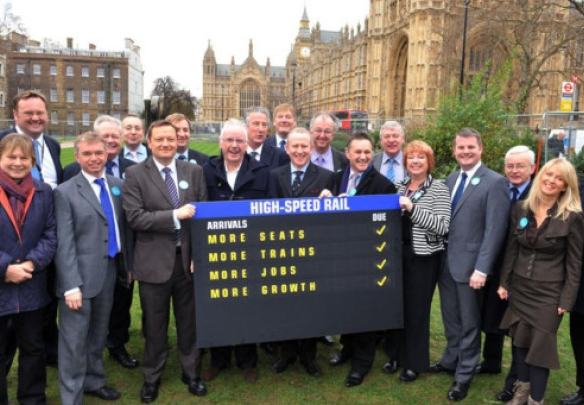 Today a report by a load of MPs who love high speed rail agreed high speed rail is good. Their group secretary is the Campaign for High Speed Rail’s campaign manager and they like to hang out with Pete Waterman – we are at a loss for words that anyone might listen to them!! How do you view the current capacity situation on Britain’s railways? What capacity do you believe Britain’s railways will require in the future? What is the best way of providing capacity and future-proofing Britain’s rail network? What will the effects of providing extra capacity be, beyond addressing journey supply? What would be risked by failing to provide that capacity? These questions formed the basis of what would have been a very worthwhile inquiry. Many people would agree that parts of Britain’s railways are woefully short of capacity. The most serious overcrowding occurs within a 60 mile radius of large conurbations (London, Birmingham, Manchester, Leeds and Glasgow) i.e. on commuter routes, according to Department for Transport information. The Chair of the Public Accounts Committee indicated that Office of Rail Regulation data over the last ten years shows that the greatest growth has been in regional rail traffic (as opposed to long-distance traffic). However this inquiry did not deliver on its potential. Only one and a half pages were used to cover local (regional) traffic issues in a 28 page report. These local discussions focussed on towns and cities served by the West Coast Main Line and HS2 rather than considering a national picture. Instead the main part of the report looked at capacity issues on the West Coast Main Line and how it believes HS2 would solve them. HS2 does not improve regional rail services. It would release capacity on the West Coast Main Line but there is no guarantee additional services will be run. The HS2 business case assumes there will be less subsidy provided to classic rail. Improving regional rail services would provide benefit to far more people than HS2 ever can, but this report did not get to grips with the key issue which thousands of commuters face every day.